What is The 'Precession of the Equinoxes? The 'Great Year' or 'Platonic' year. An Ancient Record of Precession. This remarkable cycle is due to a synchronicity between the speed of the earth's rotation around the sun, and the speed of rotation of our galaxy. 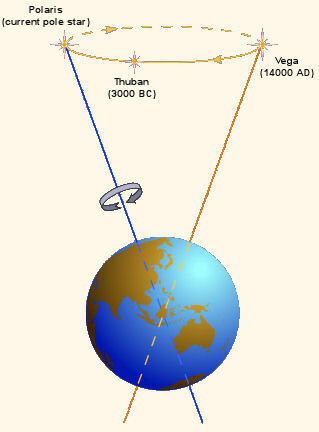 It is now suggested that at some point in the distant past this cycle was determined by astronomers (A process requiring the prolonged and precise observation of the equinoxial conjunction of the rising sun and the 'suns carrier' behind). Such a discovery goes a long way to understanding the prehistoric fascination with astronomy and the apparent 'will to move mountains' exhibited by the builders of many megalithic monuments. Lockyer observed that prehistoric astronomy was started on the horizon, which would go a long way towards explaining the early development of the English structures called 'Henges', with their built-up banks creating excellent artificial horizons. The Precessionary cycle is measured in 'months' named according to the constellation visible behind the vernal equinox sunrise. We are presently finishing the 'age of Pisces' and will be soon entering the 'age of Aquarius'. It is suggested (and supported by a growing weight of evidence), that this cycle was recognised at least as far back as the age of Taurus, although there are suggestions of recognition as far back as Leo (as represented by the Sphinx at Giza). Precession can also be measured through the tilt' of the earths axis, which causes the polar position in the sky to change, with a revolution of the earths axis around the true 'celestial pole' taking the same length of time, as the following diagrams illustrate. Where the blue circle in the diagram (right), represents the path of the pole in the northern hemisphere over a complete cycle. We can be fairly sure that the Sumerians were aware of the cycle, as we can see from the table above that it offers a natural division of both time and space into 360°, from units of 6 and 10. The Sumerians are the earliest culture to measure both time and space in units of 6 and 10. A system called the Hexi-decimal system. Remarkably, time and space are still measured today by the same units of measurement. For example, we can see the year divided by 12 months, with each day being divided by 24 hours, each one divisible by 60 minutes, and each minute by a further 60 seconds. Similarly, the earth is divided by 360 degrees, each degree being divisible by 60 'minutes and each minute by a further 60 'seconds' of an arc. 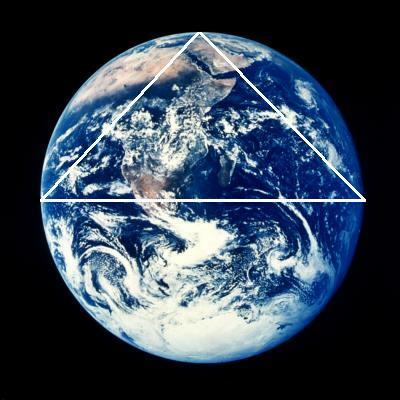 It has been shown that the exterior measurements of the 'Great' Pyramid of Giza are an accurate representation of the Earth's’ northern hemisphere on a scale of 1:43,200. In relation to this, it has been pointed out that the possibility may exist whereby the numbers expressing the Precessionary cycle (Approx' 26,000 yrs), when viewed as fractals may be translated into the 60-based system of degrees (26° 00' 00"). Modern pocket electronic calculators have a key (DD>DMS) for this function. 25.92 (doubled) = 51.84 where, 51.84° is 51° 50' 24". In other words, the angle of inclination 51° 50' 24" would express the decimal number 51.84°, which is the fractal expression of double the 25,920 Platonic Year number (25920 x 2 = 51840). This would mean that the angle of inclination cited by Piazzi Smyth for the Great pyramid of Ghiza of 51° 51' 14" would reflect the decimal number 51.85399° or the fractal halved to that of 25,926.995 years (51,85399/2=25,926.995). A number which appears at very least, an extraordinary coincidence considering the astronomical references to the pyramid throughout history. Mayan - The Mayan long count is based on large figures ascribed to astronomical observations. In this we find that 1 Tun = 360 days, 1 Katun = 7,200 days and 15 Katuns = 2,160,000 days. The great cycle was believed to last for 13 baktuns – 1,872,000 days. The present cycle comes to an end on 22 December 2012 AD. Norse - The Norse myth of the 432,000 fighters who sallied forth from Valhalla to do battle with the ‘Wolf’. India - The tradition of bull veneration is still practiced in India today, although it is becoming more watered down each year. In addition, it is said that the Agnicayana fire-alter in India has 10,800 bricks. (21). (Note 10,800 X 4 = 43,200). The Rig Veda - There are 10,800 stanzas in the Rigveda, the most ancient of the Vedic texts. Each stanza is made of 40 syllables with the result that the entire composition contains 432,000 syllables. In the Rigvega I:164 we read of the ’12-spoked wheel in which the 720 sons of Agni are established’. (21). The Old testament - This idea finds substance in the old testament which has been interpreted as including the symbolic transference from one sign to another. In the parable of the mount, when Moses came down from the mountain he saw the people worshipping a golden calf. This idol came from the Egyptians astrological worship of the sun. The calf (Taurus the bull) represents the age in which the Moses lived when he wrote the Torah. When history moved into the next sign (Aries the ram), the Hebrews celebrated the approach of their Messiah by blowing rams horns. The sign of Aries influenced many religions to adopt the lamb of God concept. The new testament - It can be seen that the new testament is similarly endowed with symbolism in the figure of Christ, who can be identified as heralding the age of Pisces. (remembering that Christianity is often symbolised by a fish) Should this theory one day be further substantiated, then quite apart from the fact that such information was detected at such an early age, there is also an incredible story to tell regards the perpetuation of such knowledge. The first recorded recognition of procession in Greece was by the astronomer Hipparchus who, whilst compiling his famous star catalogue (completed in 129 BC), noticed that the positions of the stars had shifted in a systematic way from earlier Babylonian (Chaldean) measures. In this wise and for these reasons were generated Night and Day, which are the revolution of the one and most intelligent circuit; and Month, every time that the Moon having completed her own orbit overtakes the Sun; and Year, as often as the Sun has completed his own orbit. Of the other stars the revolutions have not been discovered by men (save for a few out of the many); wherefore they have no names for them, nor do they compute and compare their relative measurements, so that they are not aware, as a rule, that the “wanderings“ of these bodies, which are hard to calculate and of wondrous complexity, constitute Time. Nevertheless, it is still quite possible to perceive that the complete number of Time fulfils the Complete Year when all the eight circuits, with their relative speeds, finish together and come to a head, when measured by the revolution of the Same and Similarly-moving. In this wise and for these reasons were generated all those stars which turn themselves about as they travel through Heaven, to the end that this Universe might be as similar as possible to the perfect and intelligible Living Creature in respect of its imitation of the Eternal. (Paragraph 39 c-d) Timaeus). It is argued (reasonably), that Plato was referring to was the orbits of the known planets, and not the constellations. Plato himself believed that knowledge of such a cycle was already known far earlier by the Egyptians and Babylonains. 1) G. Santillana and H. Von Dechend. Hamlets mill. 1983. D. R. G. Press. 21) G. Hancock. Fingerprints of the gods. Mandarin. 1996. 23) Z. Sitchin. The 12th Planet. Avon books 1976.